When my sister and I were little, my mother would often make jam tartlets with us. On these lazy afternoons, we would pull out her collection of tiny stainless steel tart molds -- in diamond, oval and triangle shapes -- which I have since inherited from her. For this challenge against Amanda, I decided to create a hybrid of those jam tartlets and the classic fresh fruit tarts you always find at good French pâtisseries (and which I made countless times at culinary school). I incorporated some ground almonds into the crust and instead of pastry cream, which would have been too sweet with the jam, I dolloped on some mascarpone. Finally, I finished the peaches with a light glaze, all French-like. You can easily turn this into one large tart (a 10-inch would work best), but it's fun to make dainty little tartlets every once in a while -- especially if there are little ones around. Oh!!! I will have to unearth and dust off my mini tart molds. I haven't thought about them for ages. Thanks for the reminder!! Fantastic! I love to make tartles either sweet or savory. Thanks for sharing. Merrill, I live in the Caribbean and finding Mascarpone is like finding water in Mars! Can you give me a good substitute suggestion? Thanks! Bluemoon, perhaps trying full-fat cream cheese as a substitute for the mascarpone. Mascarpone is a bit lighter and less salty than cream cheese..but in a pinch! I was so sure there'd be creme fraiche! ;) These look great. Love the peaches/almonds/ mascarpone combo. 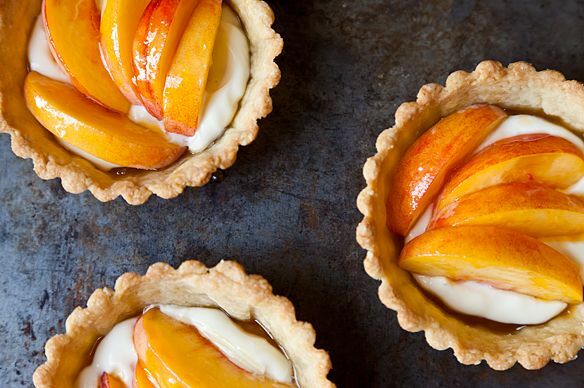 I might have to break down and buy myself some mini tart molds. Oh, darling! I just finally acquired some miniature tart molds - mine are diamond, oval, and circular - after coveting them for years. I think I'll make these (sans almonds) for their maiden voyage!